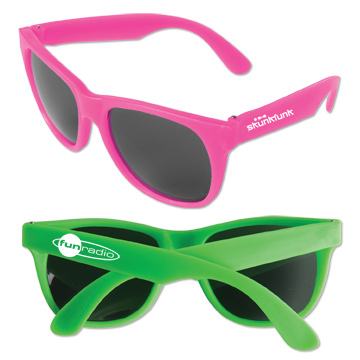 Cool Neon Sunglasses for all occasions. Order today. Personalized sunglasses, custom printed. Sunglasses are fun for all. Dark Tinted Sunglass Lenses on these Sun Glasses offer 400UV protection. These are individually cell-wrapped for added protection during delivery. Imprint area for this item: 2" x 5/16"